After every trading session, find something you can learn from. Perhaps a market structure feature. Perhaps an interesting sequence of price action. Perhaps a trade management insight. Whatever you find to be of most value! Store it in your journal. Review your journal as often as possible. 1. 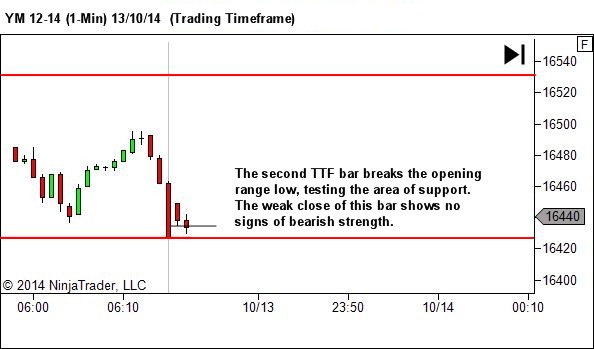 A market open in the vicinity of the prior day's low offers exceptional R:R if testing the support level with weakness. 2. A strong momentum drive into the close with no follow through overnight provides an initial expectation of a rangebound environment. 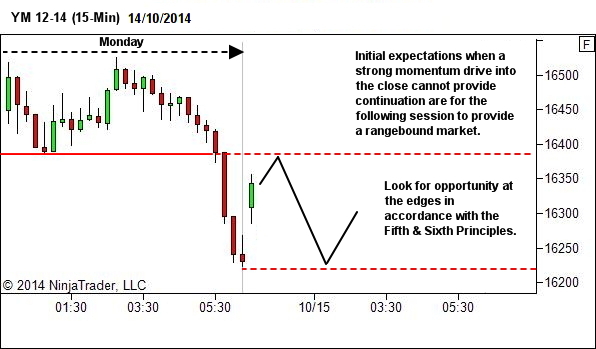 Reference: For the Fifth and Sixth Price Action Principles, see here. As we know, the market outcome for a trade is random, but when there is a group of trade, the outcome is not random, in fact, statically predictable. That come to this, what’s the need to study an individual trade when the trade is random? Or, what’s the need to justify the reason why an individual trade is moving that way or the other? That question had been on my mind as I read through your blog post. You may have know why, but currently, my mind is cloud and couldn’t find the answer. I’m really curious. Hello. 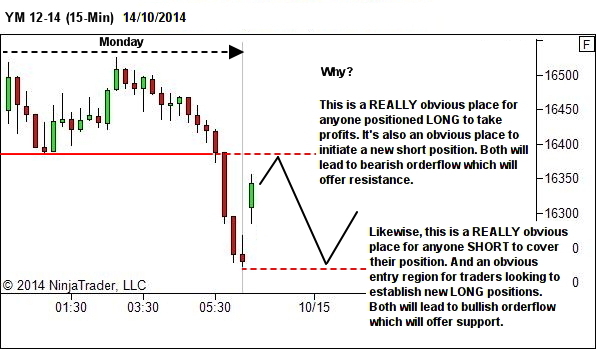 I have read http://yourtradingcoach.com/trading-business/why-do-we-create-market-structure-and-price-action-journal/, in case you might be wondering, but I still had the same question and realized I didn’t really explain what I truly means. I think illustrated the progress in an example will be a better way of point the question in my head out. 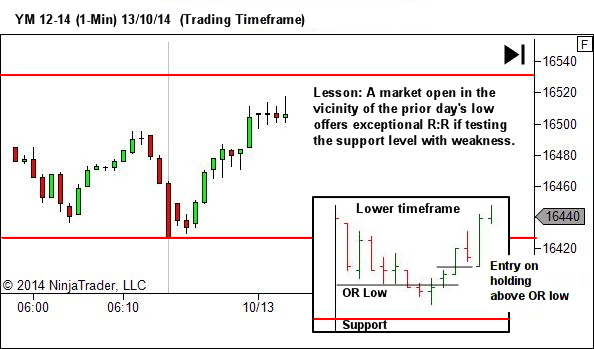 The example situation we will be using is when we are in a range. The price reaches the resistance. We have read the price action and identify that buyer who once had that much power, currently disappear, with seller showing itself. We take a sell position on the second pullback, because we do not need to take the absolute tops, but then, the price, instead of pushing down, stuck on a range too (a range in a range). When we review this chart, we will think we shouldn’t take a position on a pullback next time, but what if this only happened, let say, 40% out of 100% but we do not know it because we simply look at this one individual trade? Wouldn’t the review process hindrances our path to become a better trader instead of helping us become one? Although, it will be different if we review it weekly when we had enough sample. Neither of these article you referenced have anything to do with review of trades. They both relate to our journal for study of Market Structure & Price Action sequences. This is study we carry out post-session. The purpose being that observations, over time, allow us to develop and refine our rules-of-thumb for how to approach the markets each trading day. And improve our ability to read and assess market context in real time. This might include rules of thumb for whether or not market conditions suggest standing aside, trading normally, trading cautiously or really pressing our advantage. Or knowing when the structure of the market and early price sequences suggest potential for a trend day, or a narrow rangebound day, allowing adjustment of trade management styles to suit. Or learning the signs that suggest a trend has run it’s course. Or signs that a breakout is likely to fail or succeed. 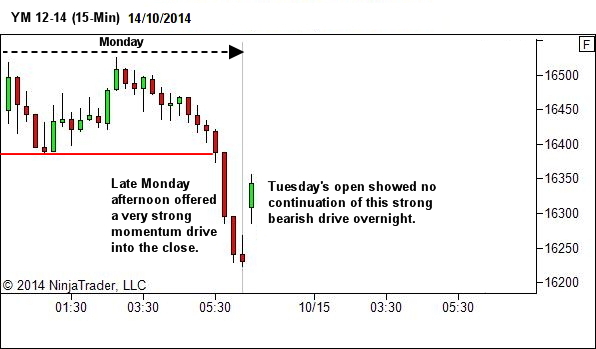 Or signs that suggest increased potential for a range to transition to a trending environment. Or… any number of other market stucture or price action observations. Part of this will also include study of where, within the market structure, price action offers potential trade opportunity. But it’s nothing to do with review of any single trade. Rather our focus is on structure, how price moves within that structure, where that might offer trade opportunity and how that opportunity is best exploited. 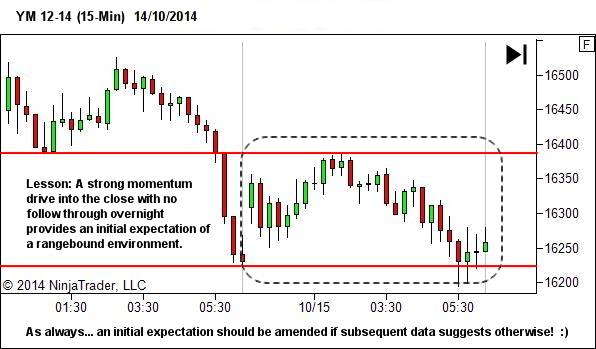 Multiple observations of the same occurrences, over time, may lead to adjustment of our trading plan. The key words being “multiple observations” and “over time”! Now, having said this, I do review trades. But primarily it’s to ensure compliance with the plan. And then also to check my performance vs hindsight based perfect performance. Did I outperform? Did I underperform? Was there anything to learn from this? 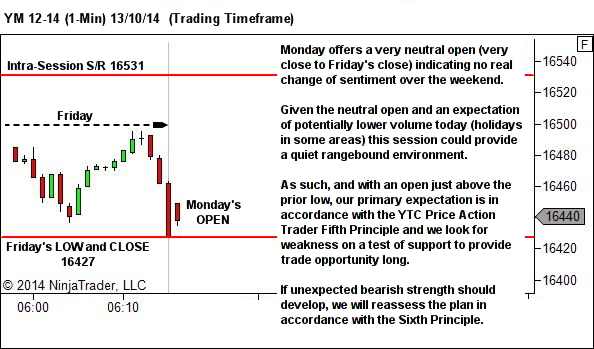 Again though, any observation from a single trade would NEVER amend strategy. Changes to strategy should ONLY be considered from analysis of stats over a much larger sample size. So with regards to your range-trading example, the simple fact that one trade did not work out, does NOT mean I would abandon all thought of further trades of that same type. But if, over a larger sample of trades, my stats identify this type of trade no longer contributing to my edge, then this would warrant further investigation, in order to find out why. And then, the trade might be dropped, or amended. But one trade loss is not ever any reason to amend a plan.